Visit S.P in numerous western locations with film and video shot over the last 12 years. This video brings in Arizona and the Lordsburg District , the coastline, Donner and a number of branchlines with great scenery, great trains and a lot of action. Branch line trains in Lompoc and Santa Cruz, as well as sugarbeet and the famous "Oil Can" trains all work their way past their lens. This video also includes some really cool SDP45 pace shots, cab ride footage, a lot of interesting camera angles and neat graphics such as maps that peel away to show the scene and way cool blends and fades. All of this is done in a fast moving editing style that doesn't leave the viewer wondering when the next train is going to enter the frame or pleading for the boring runbys to end. The presentation is rounded out with a visit to the Stockton Junction a place where the SP, UP & Santa Fe all pound the diamonds. This section features older power including high-hoods and older GE'S. It's no wonder that Stockton is a premier Western train watching location. This video is a must for every SP fan because it features all of the different facets that made SP a legend in the West. 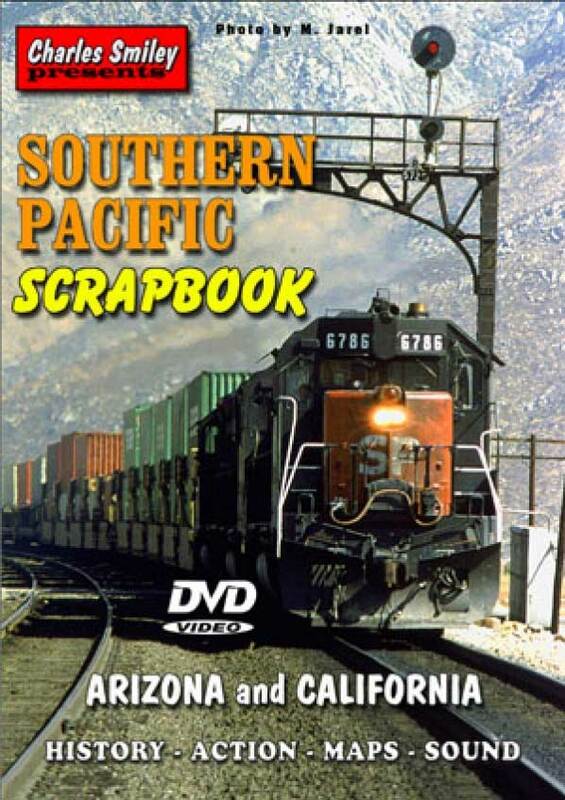 Featuring:Arizona Lordsburg District Coastline Donner Line Great Branchline Action Stockton Beet Trains Oil Can Trains Santa Cruz Branch Ione Branch Much more RAILFAN RAILROAD magazine stated Smiley does a good job of capturing the character of the SP in the days before the UP merger. This Is a darn good video, and at $30.00 for 90 minutes of tape, it's a really good deal to boot. It's a good encore to Charles Smiley's Southern Pacific By The Bay. Award Value: 118 Points Earn points for free DVDs. Signup free. MP_37 (Eastern USA) on 2013-08-19 00:05:21. Overall a solid SP video. Locations and video quality are great, but it works better as a historical documentary than as a railfan video, though this opinion does not apply to the entire video. There were segments that made me chafe: A bit too much narration, or rather ill-timed narration that overshadowed the natural approaching train sounds. Same for the music. For transitioning to scenes it was fine but often obliterated good train sounds. The excessive narration and music was most evident during the otherwise excellently shot segment of the Lordsburg sub. Also, I thought some trains were shot a bit too "tight" where if the camera was zoomed out just a bit we could see a majestic shot of a train going under a signal bridge or through majestic scenery we could could actually see that rather than a zoomed in look at a the front of a locomotive passing coming at us. Mind you, these gripes don't dominate, but to me they made what could be the ultimate video into just a pretty good one. cl6066 (England) on 2012-09-19 14:54:52. A very interesting and enjoyable dvd, it is a good balance between informative and unseen footage of one of the best railroad operators in america IMO. Mary Y (Leander, TX) on 2011-06-29 08:55:24. This video is really great. I love Smiley videos, but as a native Arizonan who grew up on the Sunset Route, the AZ footage was really great and I saw locations that Pentrex never covers like Picacho and Maricopa. Loved the over/under meet at Cieniga Creek Bridge and the Coastline and short-line footage was great.